In an enjoyable evening match on Philippe-Chatrier Court, no.2 seed Novak Djokovic proved too strong for 19th seed Albert Ramos-Vinolas. The world no.2 secured his place in the second week of the 2017 French Open with a 7-6 (5), 6-1, 6-3 victory over the Spaniard in two hours and 27 minutes on Sunday. Novak converted seven of 10 break point chances, having saved five of eight break points he faced. The defending champion is into the quarter-finals on the Parisian clay for the eighth straight year. 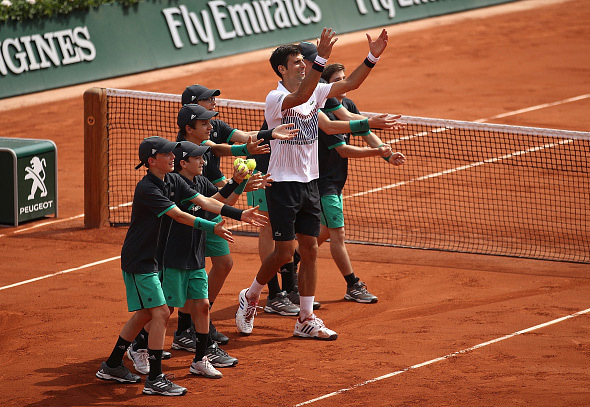 Djokovic came back twice from a break deficit in the opening set, before prevailing in a tie-breaker 7-5. Riding the momentum, the 30-year-old Belgrade native stormed to a 4-0 lead in the second set, and broke the Spaniard once again in the seventh game for two sets to love advantage. After saving a break point in the first game of the third set, Novak converted his chance for a 2-0 lead. His opponent broke back straight away and held to level the score. The 12-time Grand Slam titlist made another break in the sixth game and served it out three games later, improving his ATP H2H record against Ramos-Vinolas to 4-0. Match statistics: aces (3-3), double faults (0-2), winners (34-28), unforced errors (30-37) total points won (111-87). Awaiting Novak in the last 8 will be sixth seed Dominic Thiem (5-0 H2H record) who lost only five games in a straight sets win over Horacio Zeballos.